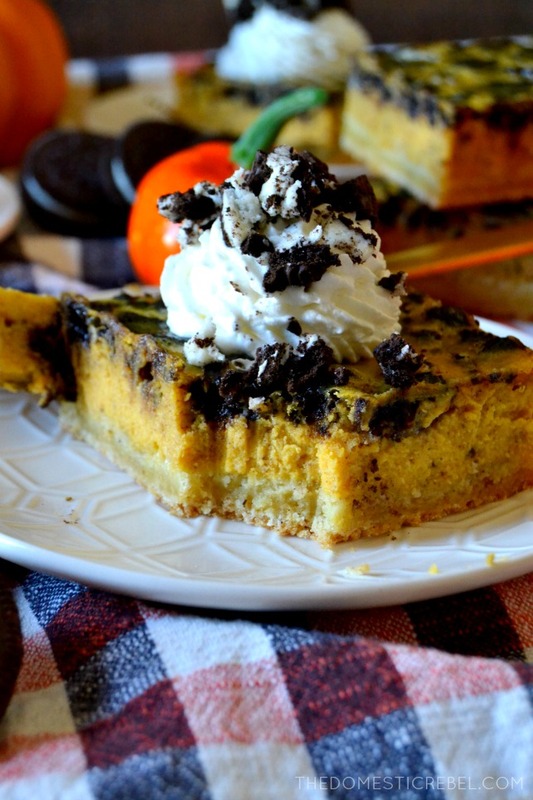 These Oreo Pumpkin Cheesecake Bars are DREAMY with a capital D! 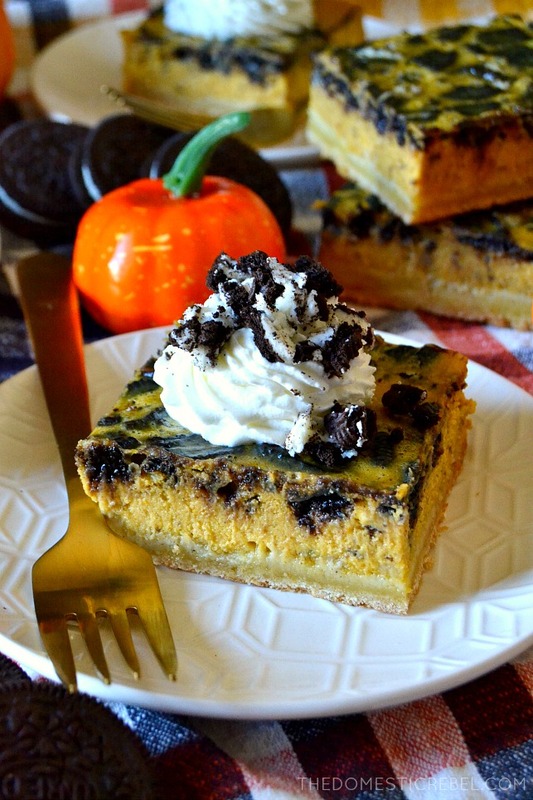 Silky smooth, creamy pumpkin spice cheesecake bars loaded with chunks of chocolaty Oreos on a shortbread crust. You have got to try these! Do you ever intend on taking something in your car to dispose of, only to let it sit around for months in your trunk? Am I the only guilty party of this? Like, maybe you cleaned out your closet 6 months ago and have had four trash bags rolling around in your backseat with the intention of heading to Goodwill… 6 months ago. Or, if you’re like me, your mom gave you a brown paper bag FILLED with old, expired medication in March that you’ve conveniently been forgetting to recycle each time you go to the pharmacy. Also, you may have picked up a 5-lb bag of sugar at Costco some day (probably in March) but because you live upstairs and had heavier, more important refrigerated stuff to carry up and down two flights of stairs, maybe you left the bag of sugar in your car and just… never took it in. So if this sounds like you (and it certainly sounds like me), you now have an exploded 5-lb bag of sugar in your trunk, mixed with a bunch of loose, expired medication rolling around. Oddly enough, my life can be described as “a sugar explosion mixed with assorted antidepressants.” My trunk is basically my interactive work of art. … I just don’t think the arresting officer who searches my car will think it’s as poignant and artistic as I do. Anyway! I just wanted to let you guys know by #keepingitreal that I’m with you in solidarity when it comes to your good intentions gone awry. 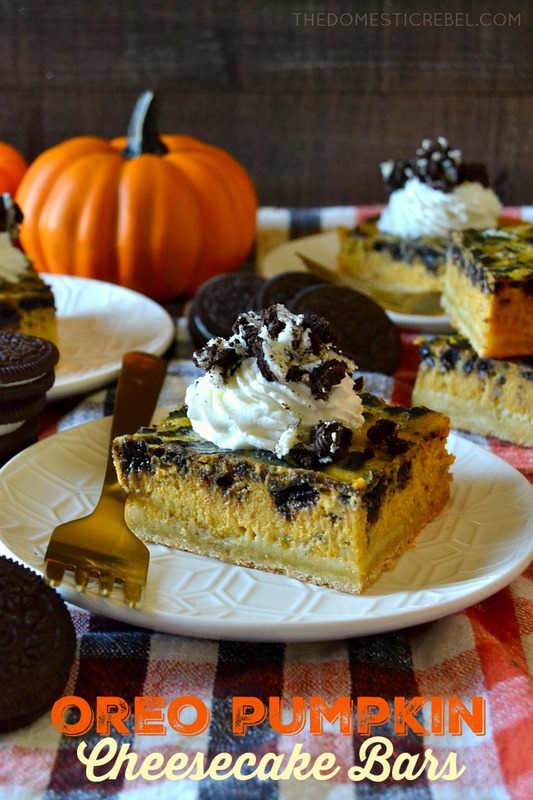 I’m also with you when it comes to craving pumpkin creations this time of year… and I’ve gotcha covered with these incredible Oreo Pumpkin Cheesecake Bars! These baddies are a twist of my Super Easy Pumpkin Cheesecake Bars, just with a chocolaty addition. 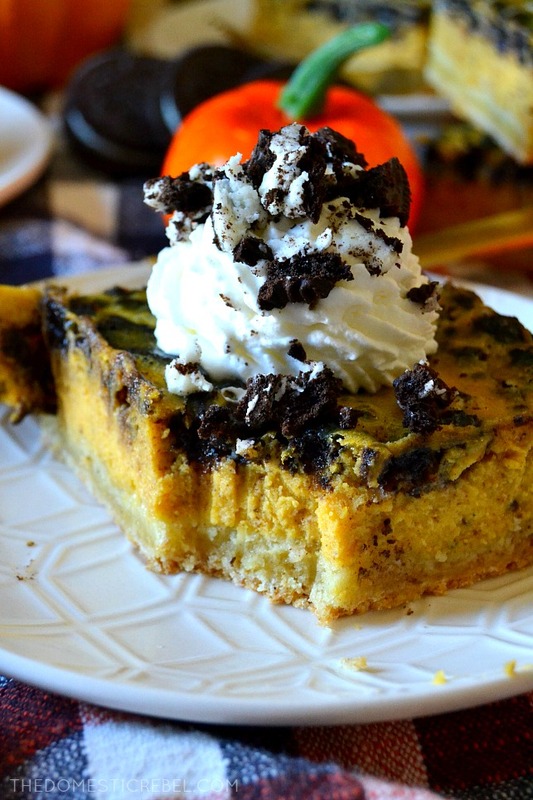 If you’ve never paired chocolate with pumpkin, please trust me – it’s a real winner! This recipe is probably the easiest pumpkin cheesecake recipe you’ll ever try. It starts with cream cheese (obviously), sweetened condensed milk, and a whole can of pumpkin puree. Now remember – you want pumpkin puree (100% pure pumpkin), NOT pumpkin pie mix. Pie mix has sugar and other additives to it and will warp the recipe. Mix in some spices (the more, the better!) and eggs, and then add in your chopped Oreo cookies (again, the more, the better!). Pour the whole thing over your makeshift shortbread crust – made easy with a box of pound cake mix, some butter and an egg – and bake it up until it’s nice and set. The hardest part is waiting for it to chill, which is mandatory so it cuts nicely and firms up properly. And as with anything pumpkin pie related, whipped cream is not optional! Get to making these, people! 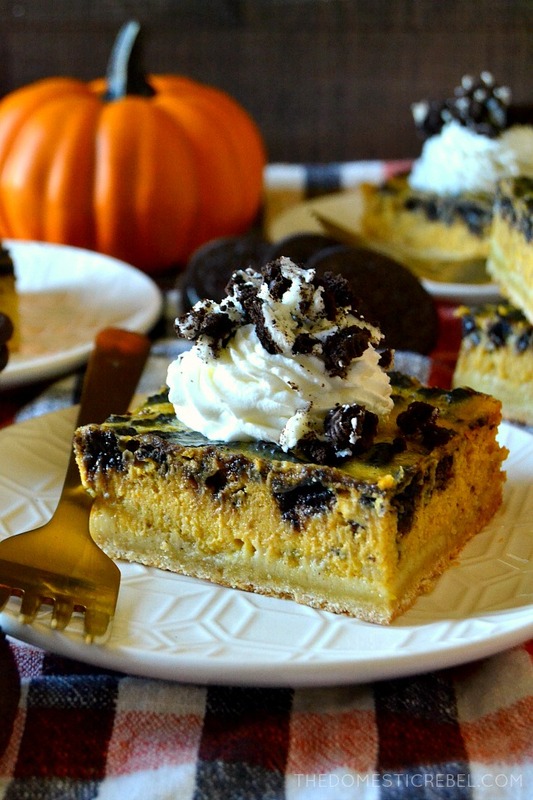 These Oreo Pumpkin Cheesecake Bars are heaven in a square! 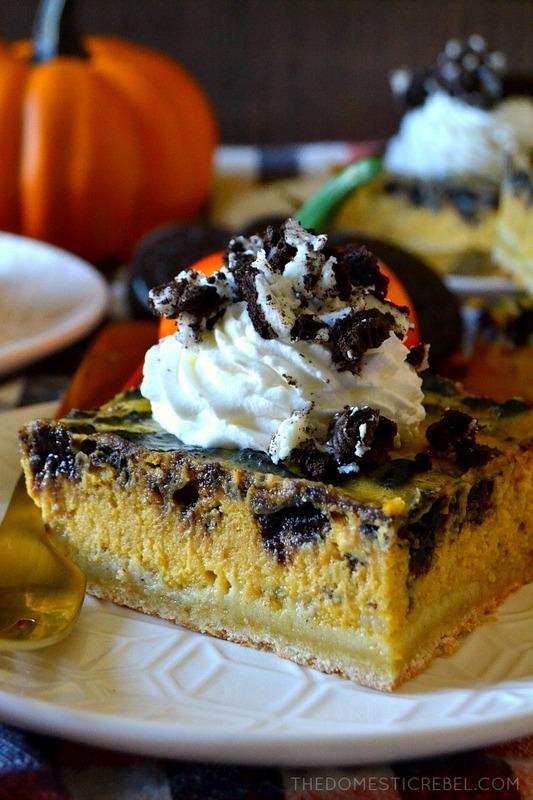 Silky smooth, lusciously creamy pumpkin pie cheesecake bars are studded with chopped Oreo cookie pieces for a fun twist on a classic fall-inspired dessert! Preheat your oven to 350 degrees F. Liberally grease a 13x9 rectangular baking pan with cooking spray; set aside. In a large bowl, combine the pound cake mix, melted butter, beaten egg, and pumpkin pie spice with a spoon until moistened and mixture resembles coarse crumbs. Mixture will look shaggy but should hold together when pressed with your fingers. Press the mixture evenly into the bottom of the cake pan. Set aside. In another large bowl, beat the cream cheese with a handheld electric mixer for 1 minute or until creamy and soft. Add in the condensed milk, pumpkin puree, eggs, and spice and beat until smooth and combined. Stir in the chopped Oreo cookie pieces. Pour the mixture into the prepared pan and smooth out the top. Bake for 30-35 minutes or until the center is set and no longer jiggly. Cool the bars in the pan until room temperature, then refrigerate for at least 2 hours to firm up before cutting into bars. Garnish with whipped cream and more crushed Oreo cookie pieces. Smooth, creamy, with crunchy, chocolaty Oreo cookie pieces in every bite! So swoon-worthy!